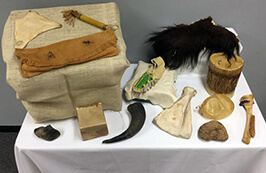 We offer a small collection of artifact trunks also called Tex Kits for loan to K-12 classrooms. Each kit has accompanying TEKS-based lessons, images, and worksheets designed to enhance your classroom learning experience. They may be checked out for up to 2 weeks and must be picked up in person at the museum. Please see below for more information on payment, guidelines and more. 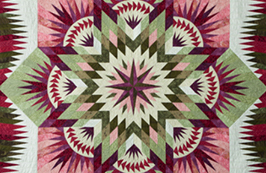 This New Tex Kit incorporates activities that inspire cross curricular connections and will teach your students how quilting has become a timeless art form that combines history, culture and geometry. Recommended for grade 4. To many people in the 1800s, Texas was a land of opportunity. The pioneers who came encountered challenges and hard work, but they found a new home and a new life. 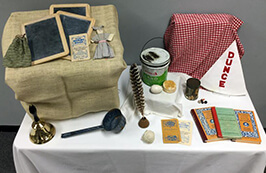 Corn, cotton, and wool were staples and washboard and a sad iron were common objects for a Pioneer woman! 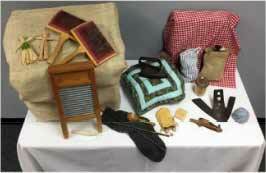 See these items and more with this kit, which examines life on the early Texas frontier. Recommended for grades 3-8. The cowboy is a true Texas icon. 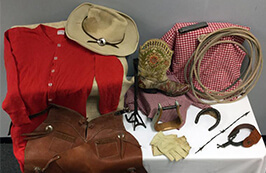 Discover the Spanish roots of this American tradition and learn about a day on the dusty trail in the 1870s by getting up close and personal with everyday objects that cowboys used. Branding irons, boots, and barb wire bring stories of longhorns and chuckwagons to life. Recommended for grades 4-8. The pioneers brought the idea of the importance of education with them when they came to Texas. 19th century schools not only provided this but also became gathering places for the community. Explore the story of Texas schools 125 years ago using slates, McGuffey Readers and an old-fashioned school bell! Recommended for grades K-4. Life of the Plains Indians revolved around the majestic American Bison. Bison long roamed the Great Plains of North America in massive herds, and Plains Indians followed them for seasonal hunts, including into the grasslands of Texas! Explore how the Plains Indians relied on bison for food, shelter, clothing, tools, and so much more. Recommended for grades 3-8. 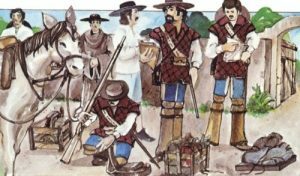 This hands on learning experience allows students to participate, imagine, compare, contrast and immerse themselves in a day in the life of Domingo Leal, a ten-year-old boy living in San Antonio during the 18th century. This is a great SA300 activity that you can incorporate in your classroom! Recommended for grade 4. May be checked out for up to 2 weeks. If more time is desired, a second reservation must be completed before the end of the first 2 weeks. Reservations are required at least 2 weeks in advance and are subject to availability. Call (210) 458-2291 or email texkits@utsa.edu. Borrower must arrange dates and times to pick up and return a trunk to the Museum between the hours of 7:30am and 4:00pm Monday through Friday. Borrower agrees to check all items against the inventory list when the trunk is checked out and again when it is returned. Items will not be cleaned, repaired, retouched or altered in any way without specific approval. Please notify the ITC of any damages. Once you have made a Tex Kit reservation you will receive a Tex Kit Loan Acknowledgement via email and must be signed. No refunds. We will gladly apply your fee to a different date if available.